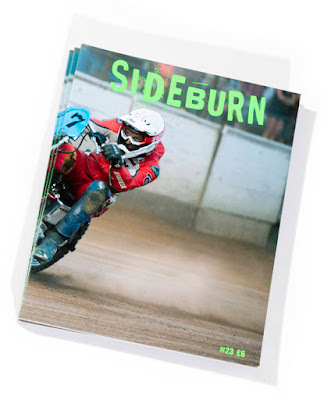 We've clawed back some copies of Sideburn 23 that we made for the Guy Martin Proper website. This is the alternative cover to the current issue. Everything inside is identical, so if you already have SB23 it's only for collector's or completists. If you don't already have SB23 it's 100 pages of motorcycle inspiration, information and life-enhancing goodness. £6 plus post from the Sideburn webshop. The cover was shot at Dirt Quake IV by Becky Matthews. Look closely and you can see Guy grinning as he powers to victory on the Krazy Horse Sportster. Guy writes the event report for DQIV in SB23.